Greece went back to the polls in June 2012, following the election six weeks earlier which had failed to produce a government. There was one fundamental divide between the parties, and one fundamental issue faced by the Greek voters. That was, whether to back the austerity deal being imposed by European leaders to bail out Greece and remain, for a while at least, in the Eurozone or to reject the deal and, in all probability, exit the Eurozone and return to the Drachma. The bourgeois parties led by New Democracy and with the support of the one-time socialist party PASOK fought to save the deal they had brokered. The right dominated the media and pushed a consistent message that exit from the euro would be even worse for Greece than austerity. Millions of Greek workers however knew that austerity was already a disaster. Unemployment has soared. The state has laid off tens of thousands of workers and private businesses were failing daily. Soup kitchens saw their queue’s lengthen and funding for essential services has dried up. Even the very sick could not obtain essential medicines as the state was no longer able to pay its bills. How much worse could it be? The attention of the world was focused onGreece, a Greek exit could have brought the euro down, with the bigger economies ofSpainandItalynext in focus. In the end Angela Merkel and David Cameron could breathe a temporary sigh of relief. The right won the election by just a few percentage points. There were four main groups on the left who went into the Greek election. SYRIZA, the KKE, the Democratic Left and ANTARSYA. 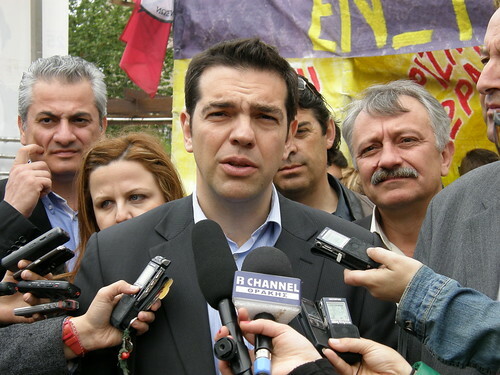 SYRIZA are a coalition of different left groups launched in 2004, the biggest component of which is the former euro-communist party Synaspismos. They have performed modestly in elections since their formation, typical of many groups of the European socialist left they did not receive more than 6% of the vote until 2012. The May election saw them achieve 16.78% which soared to 26.89% in June. This result meant that they were only a few percentage points away from being the biggest party, which would give them a fifty seat bonus and most probably power. In itself this is a remarkable achievement. It represents primarily the rejection of Pasok by the large sections of the working class who faced poverty, who could no longer stomach austerity and who rejected the loss of Greek sovereignty. Syriza siphoned the votes of the other left parties with the KKE (old-style Moscow Communist Party) vote clearly dropping in favour of Syriza. Antarsya, a grouping of the anti-capitalist left saw their vote reduce to a few thousand. But perhaps the most significant result was that the overall vote saw parties that rejected the bailout in the majority. It will be difficult for the ND/Pasok/Democratic Left government to claim a mandate and they face a tough ride.Europehas shown little indication that there can be any renegotiation of the bailout deal. If the left can mobilise on the streets in a united way then a new and decisive round of battle can begin. The stakes are high. Racist groups are on the rise, with the neo-nazi Golden Dawn party winning 21 seats in the June election. This group have carried out attacks on immigrants and political opponents across Greece, in one incident a KKE councillor was severely beaten. Golden Dawn have attacked refugee camps and threatened to drag immigrant children from hospitals. The victory for the right in Greece therefore means that the end of the euro is back to its old agenda. 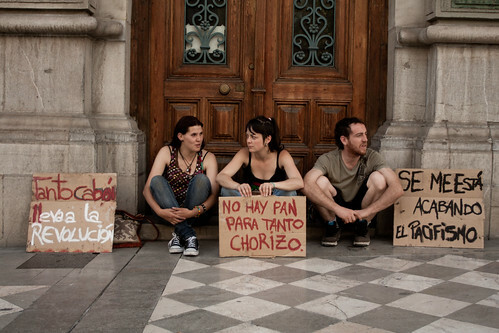 The economic problems of Spain, Italy, Ireland and Portugal have not changed. In this issue of Frontline we look at the rise of resistance to austerity among the indignados in pain, a country where youth unemployment now sits at more than fifty percent. Spain now has borrowing costs which are at a 16 year high and their banks have asked for a bailout of 19 million euros, although they may need more than 62 billion euros. The banks need huge injections of liquidity but these come at a political price. German voters are turning against bailouts. So too, would bank nationalisations – anathema to the neo-liberals of Berlin and Brussels. The single European currency was a key policy for the European elite. It aimed to create a powerful trading bloc to compete internationally and maintain profits. With their project facing meltdown that elite may have to look at more drastic action. A form of fiscal union has been suggested as the model of multiple diverging economies under a single currency has not worked. Another possibility is a ‘northern eurozone’, essentially cutting adrift the weaker economies such as Greece, Spain, Italy, Portugal and Ireland. Capitalism has clearly shown that it is not capable of solving the problems of humanity. It fails to provide a living for millions whilst concentrating wealth in the hands of a tiny minority, the much discussed one percent. Now millions acrossEuropeare turning the tide. The youth and the miners in Spain are part of this. The rise of the left in France is also an important part with the vote for the Left Party and the defeat of the right. The immense steps forward by the Marxist left in Greece too are an inspiration to socialists across Europe. Each of these are taking their own paths, and they are not the party-building methods of the past. We have an opportunity to move forward even here in Northern Europe. But socialists in Scotland and the rest of Britain may need to learn the lessons that the old movements and parties need to recognise and work with the new movements, the young people in anti-cuts groups, pro-independence groups, the occupiers and tax campaigners. If they don’t learn that lesson they may find themselves left behind.